This group of interns set out to see if having people set up their own hydroponic plants at home could help increase the survival rate of these plants. This project is an extension of a project from 2017 in which students set up hydroponic plants for Lower Brule residents. Interns gave hydroponic supplies to 22 Lower Brule residents, who saw a 40% survival of these plants. This number is slightly higher than the previous year, showing that residents not only are willing to set up their own hydroponic plants but having them do so can help increase the survival rate of those plants. This research group wanted to see if building small traditional gardens around Lower Brule would encourage more people to get involved in growing traditional plants. The students refurbished old and empty garden beds and also built new garden beds to house traditional plants at the Teen Center, West Brule Recreation Center, and the Elementary School. The students created online surveys to gauge support for these gardens and the traditional plants growing inside of them. The researchers report that community members are overwhelmingly in support of these gardens and are willing to help maintain them and help to grow these cultural plants. This summer Lower Brule interns are not only working on community centered science projects, but they are also each being supported by a college mentor from South Dakota State University. 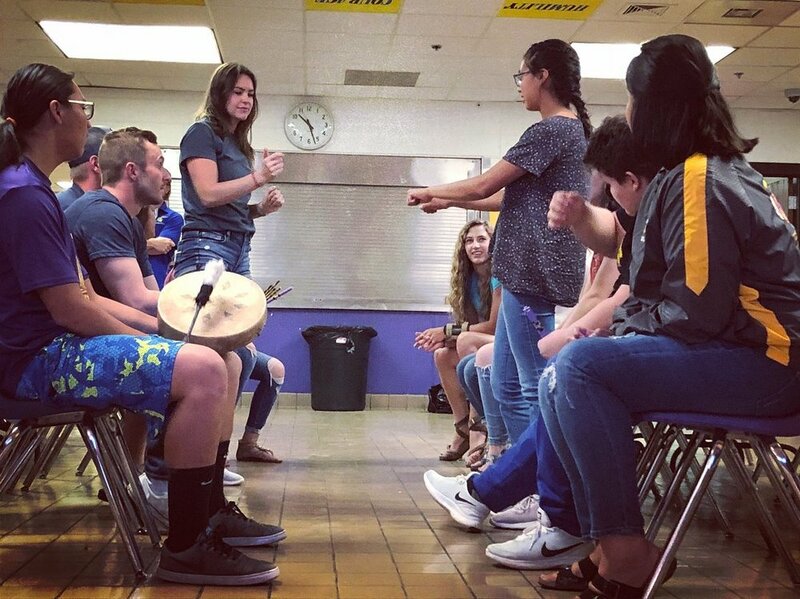 Because many of these SDSU mentors are non-native and may not be familiar with the history or culture of Lower Brule, we have been working with Lower Brule community members and others to build a cultural competency curriculum within our new mentoring program. This means part of the mentors' time is spent learning about historical and current topics of culture and race. They then use this knowledge to better connect and support their mentees. This is the first program in the nation that we are aware of to implement this type of curriculum, and we will be closely reviewing how well it works through our independent evaluator, Technology and Innovation in Education. We hope in the future that this program can be a model for others, showing how education can simultaneously help people learn the skills they need to be successful after high school, while also helping them learn how to build positive relationships with others across cultures. These three researchers explored one of science's hottest topics, behaviorally informed messaging. Behaviorally informed messaging capitalizes on insights from social and behavioral science in order to encourage a certain behavior. It's being utilized today by governments and institutions to nudge people toward healthier long-term decision making. Our researchers employed these tactics in their research project to see if they could encourage more people to get involved with the community garden. However, their results didn't show a significant difference in people's behavior based on whether the messaging was of a traditional nature or behaviorally informed. This is a topic we will continue to study as we probe deeper into how to persuade others around us, in order to build a healthier future for all. Aquaponics allows both fish and plants to grow together through a symbiotic relationship. We set out in the summer of 2017 to construct the first ever solar powered aquaponics system in Lower Brule, SD. We used this system to study which species of fish is best for small scale outdoor aquaponics in this region. We found that solar powered aquaponics is a promising method for growing fish and vegetables in Lower Brule. We also discovered that goldfish are a better type of fish to use in outdoor aquaponics compared to minnows. Students working for LBR this summer set up several experiments that are just now concluding. With the school year starting, all the classroom students get to see and take part in the final steps of these experiments. Our physical science students will be using data analysis to evaluate two alternative experimental hydroponic growing methods for cucumbers. After the cucumbers are analyzed they are prepared by the culinary class and put on the salad bar for everyone in the school to enjoy. Eating the end result of our work is a satisfying end and makes it even harder to believe that these plants were just little seedlings a couple months ago. This summer we are not only testing the best ways to grow food but also working to engage with the community to understand what might be the best types of foods to grow. We are working with SDSU Extension and their AmeriCorps members to evaluate the different varieties of food our student researchers are growing. It takes a lot to get a new program off the ground, and we work with and depend on many different groups here in the Lower Brule community. The Lower Brule Wildlife Office, Lower Brule Environmental Protection Office, USDA - Natural Resources Conservation Service, High Plains Tribal Chairmen's Health Board, SDSU Extension, and Morris Equipment have all chipped in so far this year to help get our community garden off the ground. This garden space next to the Lower Brule High School has not been used in many years, but that's about to change. Over the next couple months LBR and partners will be working to transform this into a space for growing fresh food and building community. The 8th grade earth science class started doing their part for the garden months ago, by building worm bins. These containers use worms to turn food waste into the most nutritious fertilizer anywhere. Each week the 8th graders collected food waste from students at lunch. Instead of putting their leftovers in the garbage, students put their leftover food in a container and fed that food to the worms. Turning what would normally end up in a landfill into rich organic fertilizer. You can do the same with your extra food scraps at home. Watch the video these 8th graders put together (above) on how to build a worm bin and look at the many guides online. Help your landfill, your garden, and your community for years to come.